We've eaten hotel breakfasts in all of our past moves across the country. That's not to say we didn't scour the available goods to find the most nourishing food, but sometimes we needed just a bit more than hard-boiled eggs and fruit. And those delicious-smelling, fluffy Belgian waffles were always tempting. Sometimes it was just easier to grab a few bites and get back on the road for the day. Without fail, our few bites always came back to bite us. My littles would complain of belly aches within a few hours. I felt frumpy and sluggish. And then I'd recall the saying, “Shame on me once, fool on you. Shame on me twice, fool on me.” Yes, I played the fool multiple times — and allowed my children to do the same. Fermented berries and yogurt cheese top fluffy, slightly crisp, sourdough waffles – making this a scrumptious, get-up-and-go breakfast for any morning! Fermented berries and yogurt cheese top fluffy, slightly crisp, sourdough waffles – making this a scrumptious, get-up-and-go breakfast for any morning! 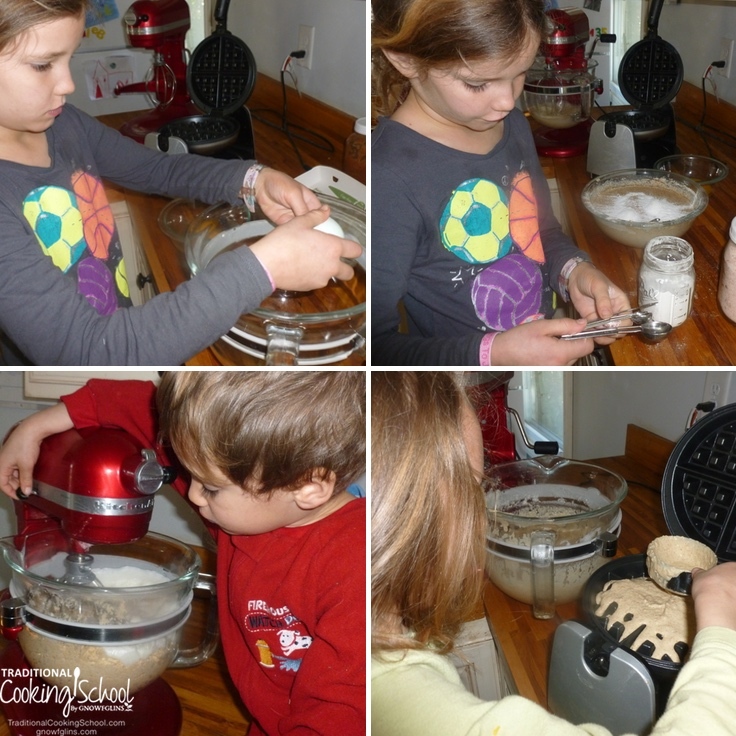 Makes 8 or 9 sourdough Belgian waffles. In a big glass bowl, combine flour, milk, and sourdough starter. Mix well, cover, and put in a safe place overnight. In the morning, beat the eggs whites until fluffy. While the egg whites are beating, add the egg yolks, baking powder, salt, and melted oil to the sourdough mixture. Mix well, then fold in the egg whites. Once warm, pour about 1/2 cup of batter into it, depending on its size. Our waffle maker takes about 2 minutes per waffle, which is plenty of time to start cooking eggs or frying bacon. Once the waffles are done, allow little hands to drop dollops of yogurt cheese and pour fermented berries on top in the shape of a smiley face. If you have a bit of a sweet tooth, add maple syrup too! Fermented berries should be the staple of every breakfast. So vibrant and flavorful, and packed with nutrition! Blend together all ingredients to your desired consistency. Transfer to a glass jar and fill to within an inch or 2 of the top. Leave in a cool, dark place for 2 days. Have these ready whenever you decide to make waffles! Fermented strawberries will keep for a month or so, but we always eat ours long before that. We use yogurt cheese like cream cheese atop our fluffy waffles to make a morning feast! Line colander with 3+ layers of cheesecloth and place the colander inside a larger bowl or pot. Wrap up the yogurt so it does not dry out. Let this sit for 1 to 2 days at room temperature, while the liquid whey drains out of the yogurt. 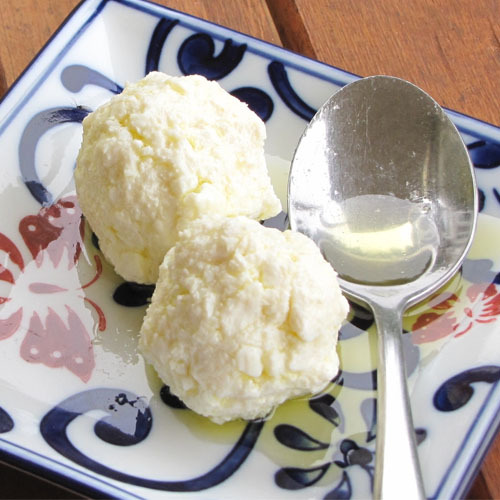 When the yogurt is a little runnier than cream cheese, put it in a bowl, cover, and store in the fridge. We add a little salt and use this as we would cream cheese. And there you have it — an amazing breakfast that gives the whole family a chance to help with. No more hotel waffle cravings! Do you enjoy fluffy waffles? 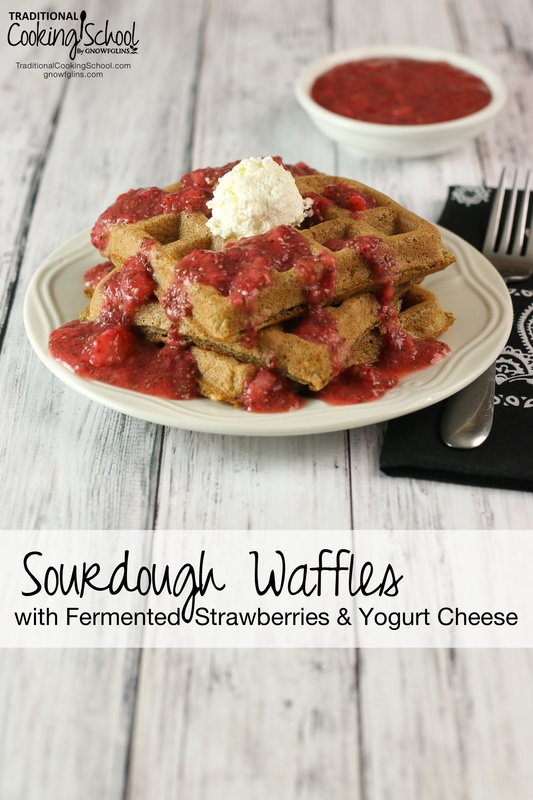 Have you ever tried sourdough waffles? This post was featured in 30 Traditionally Prepared Einkorn Goodies. Sounds great! 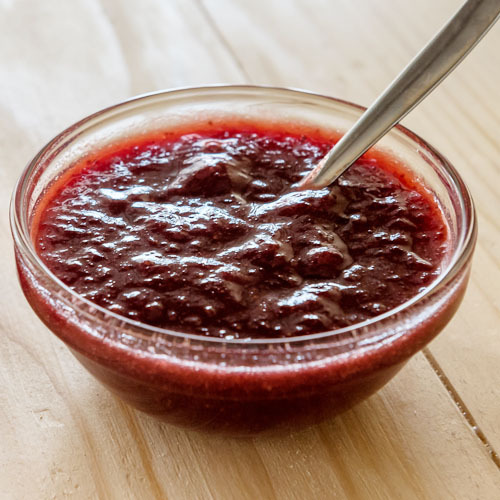 Why the chia seeds in the fermented strawberries? Are they necessary? I would imagine they help with thickening but is there any other reason they may be needed? Also, may the strawberries ever be left whole or halved rather than blended? 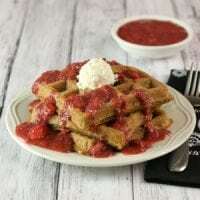 Do you have a waffle recipe without eggs…I am vegan.